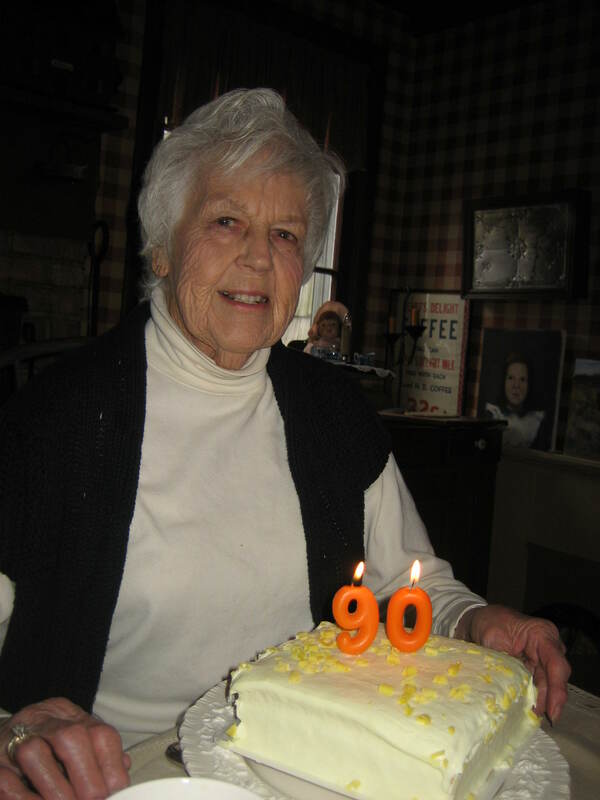 One of my friends is turning 90. You’d never know it to look at her. She doesn’t look a day over 70. This is Evie, a talented, fiesty, energetic, delight. Evie is an artist. 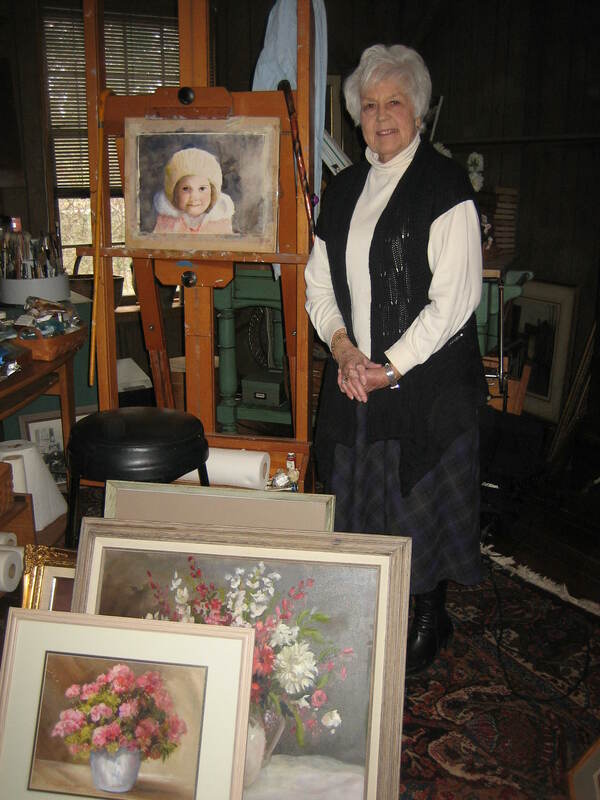 She’s won many prizes for her paintings. She’s worked in watercolor, pastel and oil. I love artists, don’t you? Many of my “dead friends” are artists –Claude Monet, Tasha Tudor, and Beatrix Potter to name just a few, but living breathing artists are special fun to know because the living ones will have you to lunch or tea. That’s exactly what Evie did the other day. What fun to be invited into someone’s home! It doesn’t happen nearly often enough these days because people just aren’t entertaining as much as they used to. A pity if you ask me. Sharing one’s home doubles the joy of having a home. Of course that means some cleaning is often in order, but cleaning should be done now and then anyway or the dust bunnies and spider webs will overtake the place. I know it’s a little work to set a pretty table, but what a treat for guests to step into someone’s dining room and come upon this sort of vision — a table set with antique linen, elegant china, candles, a bit of nature, and crystal, all waiting to serve and enchant us. Evie took us into her studio and showed us many of her paintings. There were beautiful hydrangeas, many more flowers all looking so very realistic. There were portrait paintings and scenes from some of her favorite places. Just to be present in her artist’s studio made my own artistic tendencies bubble inside of me. I’m sure sharing doubled her joy too. Sharing is like that. We all are artists even though many of us don’t realize it. We all have creative talent. What have you created lately? It does take a bit of courage to exercise our creativity, to be a true artist… for when we do something truly original we take the chance that people will think we’re foolish. But that shouldn’t stop us. Even some of our greatest composers and painters weren’t appreciated till years after their deaths. Besides, a true artist (and that’s what we all should be) is creating for himself, not for other people. We should simply allow our spirit to express itself. Having the right sort of friends, friends who are truly alive, following their heart, doing the things they love to do, cultivating passions — these are the kind of friends we all should have. I’m happy to say I meet 9 year olds, 90 year olds and everything in between, before and after — all wonderful companions who help make my time on earth delightful, and one of those 90 year olds is Evie. Hello friend. Glad to see you have started your blog. Mine is amothermusings.blogspot.com, so stop by sometime. What a lovely tribute to a lovely lady! And sadly, you are correct ~ not enough of us entertain at home anymore. But perhaps that makes it more special when a handful of us do. Here’s to creating a warm and welcoming space to all who enter! What an enjoyable read. I love inviting a friend for lunch…. We pretend we are women from the 1950’s when life didnt seem so rushed! You are a girl after my own heart.I live my daily life like it’s still the 50’s or even earlier. Sorry it’s taken me so long to reply to your comment. You may not believe this but just today I figured out how to go back and make replies to past comments. Now I’m waiting for that letter you promised. Maybe it will arrive today. Hello Tamra. I haven’t forgotten you. Hope all is well.